El dosificador se desmonta del compartimento para facilitar la limpieza. I wanted to get a sensor pump for a while and finally got this one. I love the fact that you can change the amount of soap to use. The sponge caddy is great, it keeps the sponge upright and out of sight. It looks neat near the sink. Très bel appareil, pratique pour doser la quantité de savon grâce au réglage + ou - et distribuer son liquide vaisselle sans contacts des mains. Je le recommande à tous. The caddy is too wide for my sink/counter. The area it needs to be is narrow. The caddy is great, just doesn't fit! I would like to return the caddy but I did not save the receipt. Can I still return it and get my money back? I love it. I did have some issues with 2 pumps that I bought. 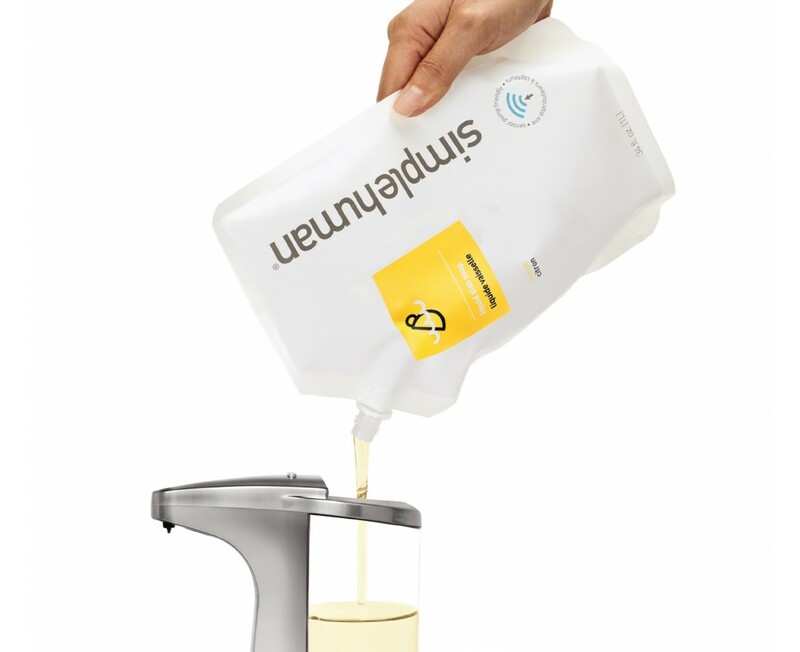 They started continuously pumping, but after contacting their Customer Service dept, I sent them back to Simplehuman and they sent me a new one, each time. It says a lot about a company with stand behind their products! I'm hoping they were just minor glitches and hope to continue buying these pumps when they wear out. Thank you! Not all it's cracked up to be! I am on my third unit of this product. Whereas, I like how it works, the product has quit working on me twice. The last time it happened, I was told there was some corrosion in the battery compartment due to water getting it. They told me to try to keep it away from water. Really? Kind of hard to do considering its purpose. On the flip side, the customer service has been wonderful with both occurrences having been handled quickly and effortlessly. I hope the third time is a charm. Easy to use, clean, sanitary and looks nice. This is the second one I purchased. I had a problem with the second one, but after talking to customer service, they quickly replaced it and made good on their warranty. I love it because I don't have to touch a soap dispenser with my hands. It looks very nice at our kitchen sink and the caddy is great for holding a sponge. My original one which is 3 years old but still working had some age related scratches and no caddy so I purchased this one to replace it. Works great. I like the larger size. Have not had any clogging. Use a natural alternative soap, my favorite I have been using for years. We bought three sensor pumps from Simplehuman a few months ago, two white ones for the bathrooms and a nickle one for the kitchen. We have been very impressed with the build and quality, the adjustments for quantities are very good too. Just hope that they last a long time as they are expensive. Ce distributeur est de bonne facture, bien fini et facile à loger. Cependant le rangement me semble peu utile, il est situé très prêt du capteur et en y accédant on déclenche une dose de savon. Bon produit, silencieux très bien fini et facile à loger, je le recommande. C'est devenu, une drogue, je ne peux pas m'en passer! Par contre les piles s'usent très vite. I have 2 of the sensor pumps, 1 for dishes and 1 for hands and love them. Don't know how I did without them. Also have a kitchen garbage can and love that as well. These soap and dish soap pumps are excellent! I really like these products to the extent that I have made them a present for anyone that is on my list. Both our bathrooms have one each and the kitchen has this one pictures above. Once in a while it acts up and doesn't dispense soap but overall I really like using the product. I bought the predecessor to this product just over two years ago. Identical dispenser but without the tray and sponge holder. I use it seasonally at my home that is only occupied six months of the year. When I returned in November of this year the pump is not working. It was making a grinding type of noise but not pumping out any soap. I contacted customer service who told me that the two-year warranty had expired. They also said that this is the expected life of the product so my only option was to buy a new one albeit at a 20% discount. Although the customer service was certainly helpful, I find it a bit disturbing that the expected life of a product of this nature is only two years. Welcome to the disposable culture I guess. We apologize for the difficulties you are experiencing with your sensor pump and appreciate your patience. It sounds like your unit may be clogged. Let’s go through the following procedure to unclog your dispenser. 1. Make sure all soap is removed from the reservoir. 2. Pour in about a ¼ cup of rubbing alcohol (99% is recommended) into the reservoir. 3. Press and hold the (+) button to run the alcohol through the dispenser. 4. Release (+) button after the alcohol flows through and exits the dispenser. 5. Allow the alcohol to sit in the dispenser for 10-15 minutes. 6. Press and hold the (+) button to run the alcohol through the dispenser once again. 7. Remove all the alcohol from the reservoir by continuously priming the dispenser. 8. (optional) Repeat steps 2-7 if the dispenser is clogged. 9. Add water into the reservoir to rinse out the alcohol. 10. 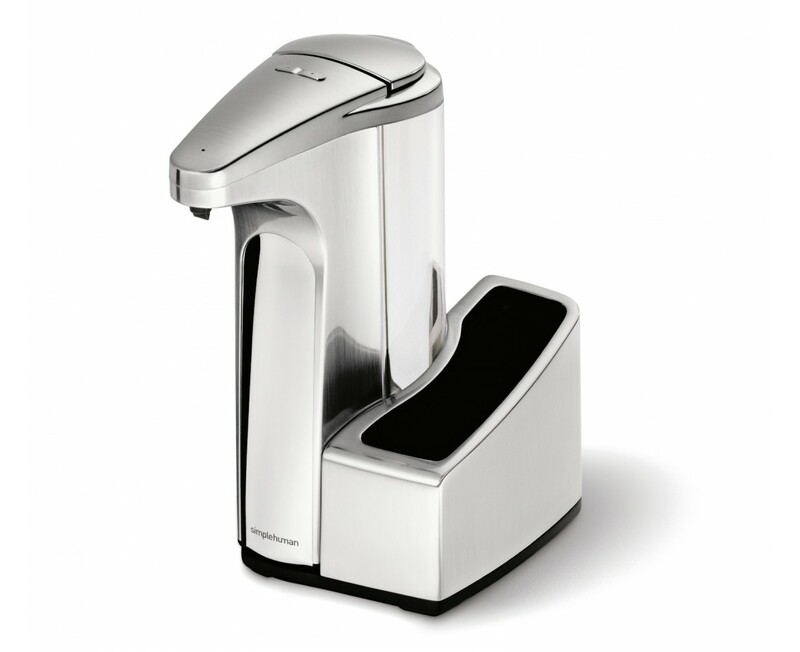 Press and hold the (+) button to run the water through the dispenser. 11. Add soap for immediate use. ** Rubbing alcohol (isopropyl alcohol) 99% is recommended but 70% can also be used. Other options to use would include (but are not limited to): 1) Other alcohol based liquids 2) Citric acid (decalcifier for coffee machines) 3) Water Let me know if this does not solve the issue. Thank you for allowing us to work through this problem with you. A nice and convenient product. Beware to use a damp cloth to clean and do not get too wet when cleaning. I love this soap pump, it looks great and works great. Looks good and works well for a limited time period. Pump tends to clog and water has to be added to the dish detergent so that it does not hopefully clog. We are on our 3rd pump because of the clogging issue. Thank you for your feedback. If the pump becomes clogged, please prime the pump by pressing and holding down the + button for several seconds. This allows the motor to continuously run, and will push out any debris that may be stuck inside of the pump. These sensor pumps are great household devices. I have several of the smaller rechargeable units already in our bathrooms. This was an upgrade / replacement for the kitchen unit that was damaged in a fall. (It would have gotten 5 stars if it was a rechargeable unit like the others.) 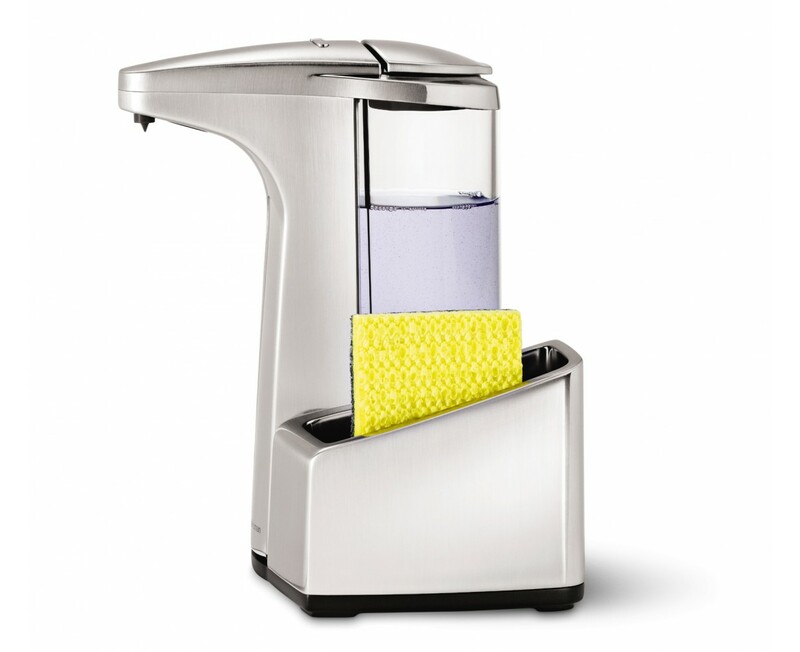 The sponge caddy is useful, but the entire unit has a bit bigger "footprint" than the smaller rechargeable units, and is difficult to make it sit evenly on the sink edge itself, whereas the smaller rechargeable units are a perfect fit. OTOH, it holds more soap. One other slight flaw in these is that they are definitely unable to sustain even a short fall to a relatively soft (linoleum) surface. I have had two that have suffered malfunctions or breakages on a two or three foot fall (due to the containers being slightly soapy and damp). Maybe a more robust build and some tougher testing would help. 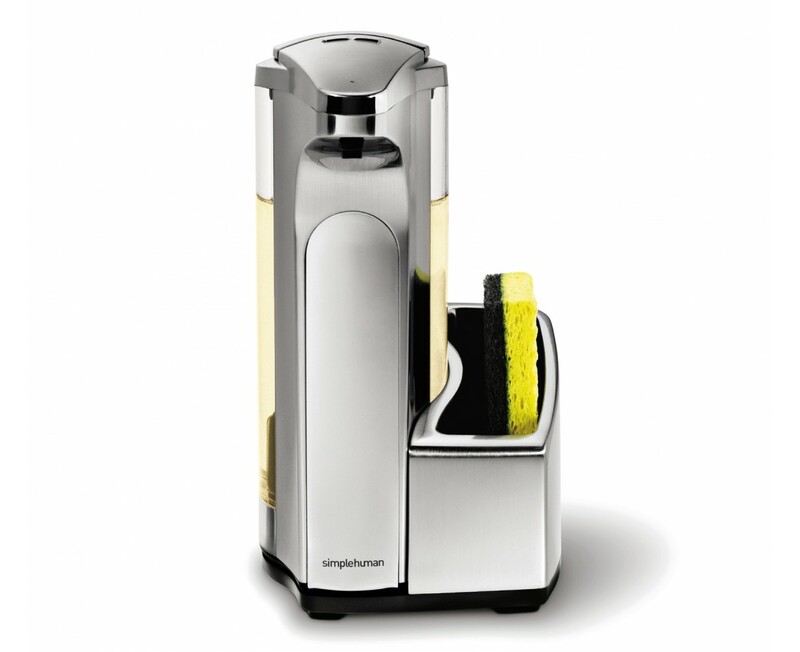 Still, despite these minor issues and the relatively high price, I consider these dispensers yet another great Simplehuman product. They have definitely helped us become even more hygienic (due to ease of use) and we now can use measured amounts of soap. (We use our own organic biocompatible soap instead of the scented, colored soap they supply, and despite the fact that ours is much thinner and more dilute, it functions beautifully with minimal maintenance. We consider them indispensable, and we now have one by every sink. I LOVE the sensor pump! The caddy does not permit the sponge to dry, so I have to angle the sponge so that it stays almost on top of the caddy. Might be a good idea to re-think how the caddy is made to permit sponge drying. BUT, I love the caddy! I think the caddy which comes with the Large sensor pump is useless ..I wanted a sensor pump that was larger but the only way I could obtain it was to buy the caddy sensor pump. In the past I have purchased numerous pumps but his is the first time that I had to end up with a piece of JUNK attached and the additional cost. I THINK THIS IS A BOLD RIP-OFF. We're very pleased with the 13 oz sensor pump with caddy. I wanted that 13 oz pump but it was no longer available by itself so had to buy it with the caddy. I didn't think I'd like the caddy but it is perfect for the nylon scrubbing pad that I no longer have to find below the sink. On my second soap pump after first quit pumping after a couple of months. So far so good. Only using simple human soap this time. Used Palmolive last time before the pump quit. Dirctions I received said any similar soap was OK, but thought I would try only theirs while the free sample lasts. Return was easy, just without device while it went back and forth. Good pump, but GREAT customer service. I bought this pump for my house, mom loves it. It does what it advertised to do, and does it well. And it looks really fancy. At first we bought their soap, but mom didnt like it, so we just stick to conventional soap (Dawn and Palmolive). The one I've got in Bed, bath and beyond broke probably within 2 weeks (a defective unit, it can happen to anything). I contacted Simplehuman for support and they were great. They offered me to fix it for free or send me a replacement, and so they did. The one they sent has been running great for the past month+. This company backs up their products. I would do business with them again. Better than any soap pump I have ever tried! No dripping on counter after it dispenses; the right amount I might add. It is also attractive looking. I really do love this pump! The best product so far....! I purchased this along with the lemon dish liquid, fantastic idea. The señors amazing everyone in our house now want to do the dishes - even my 12yr old & 5yr old!!! - great holder on the side - cloth ~ sponge ~ brush, it's also money saving - lasts very long ! Thankyou for amazing products everytime will be buying more! While still being a good pump,the way it's design makes the soap disperse with the slightest movement underneath the sensor. I have accidentally had a paper towel slide underneath it and it dispersed soap all over the countertop. I sent my previous model in from the warranty and recieved this one in its place. To be honest Ii liked the older one better. The on/off option is a bit bothersome. You have to use the same buttons for the amount to dispense which creates problems on the pump determining which one you want. Other that these two elements the pump works pretty good so far, if you don't mind random soap on your countertop. Me and my wife actually argued about who left soap on ittGreatly appreciated if this was improved. Great Idea! We had two dispensers at the kitchen sink, one for hand soap and one that dispensed dish soap. Now we have consolidated the two into this dispenser and the sponge caddy is so convenient. Very pleased. The pump works perfectly but the sensor is a bit too sensitive. Your hand movement can activate the pump by just getting too close. I also found that it will drip dish soap if you are not careful to brush the sponge past the dispenser after pumping. The caddy could be larger as it barely hold one small sponge. On a positive note it's very stylish and is much cleaner and easier to use than a bottle of Dawn sitting on the edge of the sink. I bought one for my bathroom and the hand soap pumps just fine so I was excited to get one for the kitchen. However, the dish soap comes out so slow and seems to get stuck so you have to make 3 or 4 passes to get it going. Also, not to thrilled with the dish soap. Once I finish what I have I will just use it for hand soap. Very dissappointing. Thank you for your feedback. It sounds like the pump may need to be primed by pressing and holding down the 'plus' button. This helps to push out any debris that might be clogging the pump. The volume may also need to be adjusted on your pump. You can adjust the flow of soap by using the 'plus' and 'minus' buttons at the top of the unit. A product specialist has reached out to you to provide further assistance. Pump and caddy works well, good quality. The only downside is that the pump does not secure to the caddy. You have to use.2 hands to move it. Other than that I am pleased with the product. Regarding the soap pump, we have been very happy with the sensor pump. It works very quickly and efficiently. My only complaint is that there is not venting in the caddy, so any moisture that is in the sponge quickly generates a mildew smell that is nearly impossible to cleanse. This product would benefit greatly from a small drain. The anti-fog mirror, on the other hand, has been fantastic. My husband really enjoys it and has not complaints whatsoever. I love its sleek look but after a few weeks of working it won't put more than a minuscule dab out. If we wait a few minutes we might get two dabs. The directions say just rub the little rubber nib where it comes out and release any air bubbles. there is no way without pouring all the liquid out and trying to pour hot water through it to see if it works. It might come down to that. It does turn on and off fine and the battery is charged. Thank you for your feedback. Priming the pump should fix this problem. To do this, simply press and hold down the 'plus' button for several seconds to allow the motor to run. This will help push out anything that may be clogging the pump. Also, to ensure that your soap pump functions properly, please make sure that you are only using alkaline batteries, not rechargeable batteries. Feel free to call us at 877-988-7770 (Mon-Fri 8am-5pm PST) if you have any further questions. LOVE, LOVE, LOVE IT!!!!! I never hesitate to purchase a Simple Human product because I know it's going to be great.